The war against fascist Germany came to an end when the Red Army stormed Berlin, captured Hitler’s bunker and wiped out the seat of Nazism. Shortly afterwards, the victorious Soviet leadership allowed their Anglo-US allies in the anti-fascist alliance to enter the city that the Soviet army had captured at such cost. Dozens, perhaps hundreds of agents were stranded on the wrong side of the new border – the hastily erected “wall”. Like Vienna, the German capital was to be divided into four zones of occupation (Soviet, British, US and French), as were both Austria and Germany. This had been agreed at the Yalta conference of the Big Three (Churchill, Stalin and Roosevelt), whose decisions in no way envisaged the permanent partition of Germany. Nor did the boardrooms of Wall Street and the City, London’s financial and banking centre: their goal was to push the beastly Bolsheviks back from the Elbe all the way to Moscow and beyond – hopefully into oblivion! The four-power occupation of Berlin and Vienna was not allowed to operate successfully. The denazification process was made inoperable in the three Western zones of Germany. The operation of the Berlin underground by the authorities in the Eastern (Soviet) sector was sabotaged whenever the trains ran through the western parts of the city, culminating in the planting of a bomb on a train. The underground had to be restricted to the east. The currency in the western zones was arbitrarily changed, effectively creating two Germanys. Even the status of Berlin as the capital of Germany under four-power occupation was unilaterally changed, with the Berlin airlift attempting to force the de-facto recognition of the western part of the city as an official outpost of the western part of the country. The division of Germany was brought about by the West, as the means of securing German capitalism from Bolshevik collectivisation, and to allow Germany to be rearmed, reunited and relaunched against the Bolshevik scourge in the East. Unfortunately, it did not go according to plan. Throughout the 1950s the West poured money into Western Germany, to re-establish the great German corporations that US and British capital had maintained strong links with right through the War, and to simultaneously score propaganda points off the capital-deficient East. In the east of Germany, education, the judiciary, the landed estates, the factories, all had been denazified. All the former supporters of Hitler and co who lost their positions or their property looked for the chance to go to the west. It wasn’t hard to find, for although the border was closed (and mined on the Western side), in Berlin it was wide open. Over 70 Western intelligence services had stations in west Berlin. It was a gateway to all of Eastern Europe. The Western powers had irrevocably divided the country by formally establishing the Federal Republic of Germany out of the three western zones and installing the pro-Nazi Konrad Adenauer as Chancellor. The anti-fascists of the largely rural eastern zone then founded the German Democratic Republic, which the West of course refused even to recognise. For a decade, the attempts of the new GDR government to industrialise and rebuild the economy of the eastern region were systematically frustrated by massive, well-orchestrated sabotage from the West, by way of west Berlin. If the GDR government announced plans to develop ship-building or chemical industries, specialists in those industries would soon receive letters, notes under doors, visits from “friends”, offering extremely well-paid positions in the West, complete with large flat and flash car. Times were tough and many took these offers, as they were meant to. They simply crossed over into west Berlin and went to the addresses they’d been given and that was that. A well-organised brain-drain was bleeding the GDR’s economy through an open wound called the border with west Berlin. 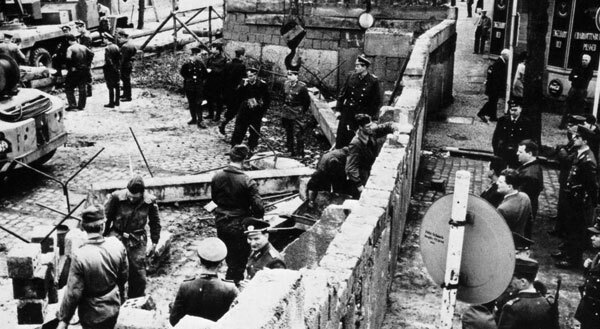 The decision to close the open border between East and West Berlin was made at 4pm on August 12, 1961. It was put into effect without any announcement, at midnight the following Sunday. The West was caught flat-footed. Dozens, perhaps hundreds of agents were stranded on the wrong side of the new border – the hastily erected “wall”. The black-marketeering in East Berlin, using Western currency that had been encouraged by certain Western agencies, came to a shuddering stop. From the day the Wall was erected the economy of the GDR never looked back. It developed steadily to become the tenth leading industrialised country in the world. In comparison, from the day the Wall came down, the economy of eastern Germany went down the drain. Its people lost their industries, their agriculture, their jobs, their public housing, free health care, union holidays, free education, government funded arts and culture. The people who glibly rejoiced in the “fall of the wall” on November 9, 1989, in the ending of the “partitioning of Germany”, should remember who divided Germany in the first place, and should spare a thought for the working people of eastern Germany, the victims of the “fall of the wall”.